Do you need fish meal, fish oil or any marine ingredient? Do you need a special meal for your aqua, swine, poultry, dairy, or a pet food diet? Are you looking for a very specific level of protein, fat, ash, or pigment in your formula? Proteus has the expertise to both find the right ingredient and provide the latest market information to help you make informed decisions. 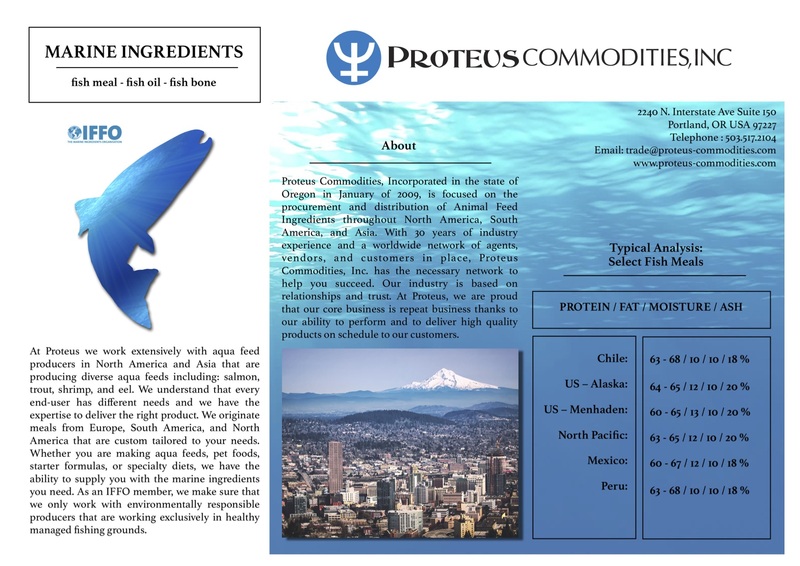 At Proteus we work extensively with aqua feed producers in North America and Asia that are producing diverse feeds including; salmon, trout, shrimp and eel. We understand that every end-user has different needs and we have the expertise to deliver the right product. We originate meals from Europe, South America and North America that are custom tailored to your needs. Whether you are making aqua feeds, pet foods, starter formulas, or specialty diets, we have the ability to supply you with the marine ingredient you need. As an IFFO member we make sure that we only work with environmentally responsible producers that are working exclusively in healthy managed fishing grounds. Proteus Commodities is a Proud Member of IFFO – The Marine Ingredients Organization, and supports the IFFO Global Standard for Responsible supply “RS” IFFO RS Standard. Download our Marine Products Flyer Here.